Seminar dates will be posted on the PT calendar. Each year three internationally renowned experts in the field of neuromuscular plasticity and rehabilitation are invited to present a platform presentation, meet with the NMPT program trainees and faculty mentors, and provide feedback on the progress of the NMPT program. Three PT CEU’s are offered. This seminar is designed to foster interdisciplinary discussions and collaborations. The lecture series include both local and external experts in rehabilitation related research, with a primary emphasis on neuromuscular plasticity. This forum provides the students an opportunity to get familiar with research activities at the University of Florida and Rehabilitation Centers and Institutes across the country. Following the presentations, students, postdoctoral fellows and faculty are given an opportunity to meet with the speakers and discuss research ideas and projects. One PT CEU is offered. These weekly seminars are organized in the summer and consist entirely of student presentations. Each week two senior Ph.D. or post-doctoral students provide a scientific presentation on their research topic. 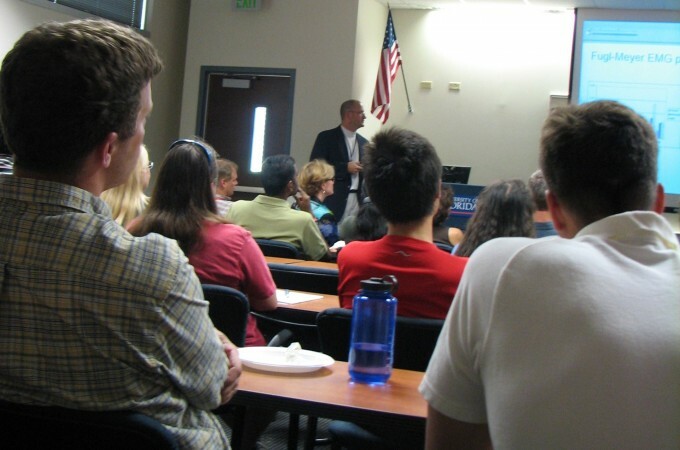 During these seminars ample time is provided for discussion, and the diverse audience of students and faculty typically provide valuable feedback to the students, as well as increased interaction among the students and faculty. One PT CEU is offered.